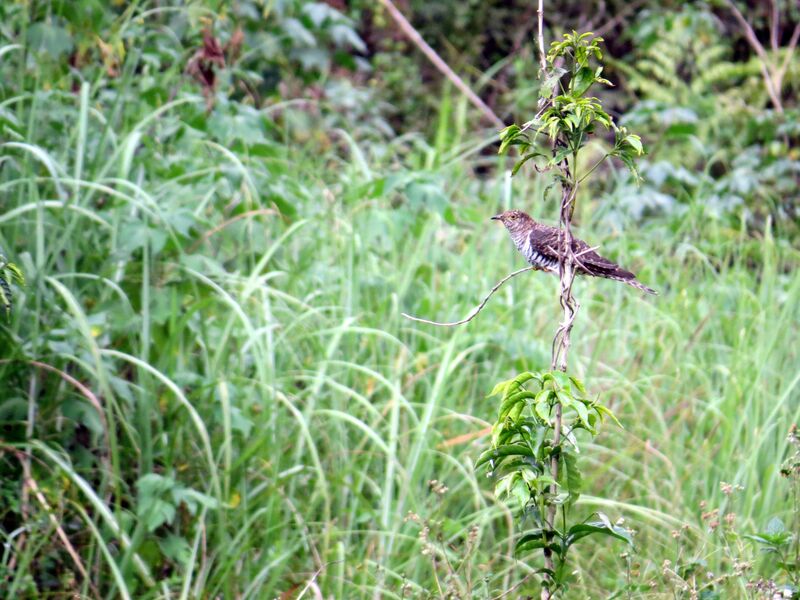 The Oriental and Himalayan Cuckoo were split in the 2013 WBCP Checklist. They are difficult to tell apart in the field. In this article, Juan Mesquida makes a provisional ID based on the comparative sizes of he birds. He also states however that he leaves it to the experts to decide on the ID at a later time based on the evidence. 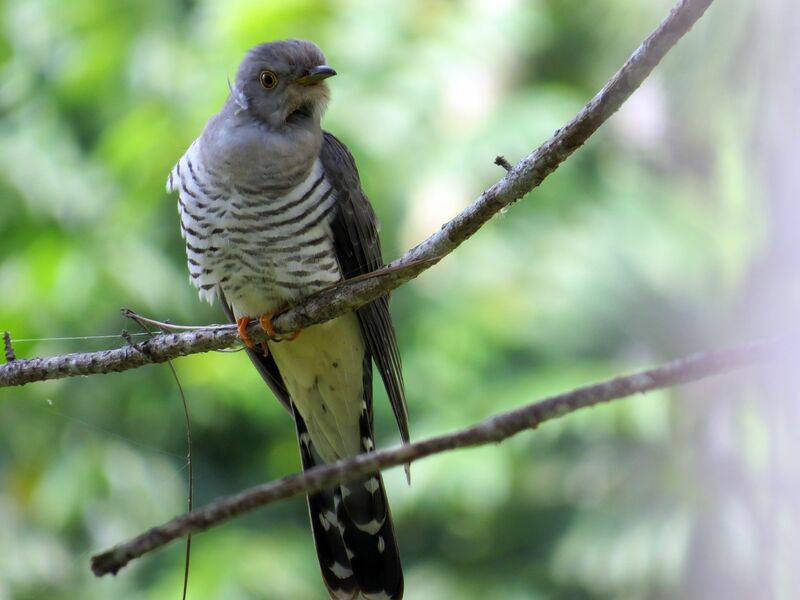 He also describes the female cuckoo as “hepatic”. This is a brown form of some females of several species of cuckoos. This is an unusual story. When it happened I was immediately reminded of the charming chapter “The Little Prince and the Fox.” You will see why. It all started with Gino Lacaya (upcoming WCBP member), Rene Calado, and I attending a seminar this April in Mountain Pines Place, Barangay Bagalangit, Manolo Fortich, Bukidnon. A beautiful mountain lodging. Soon we noticed three Oriental/Himalayan Cuckoos in the vicinity of the resort. Two males and one Hepatic female. 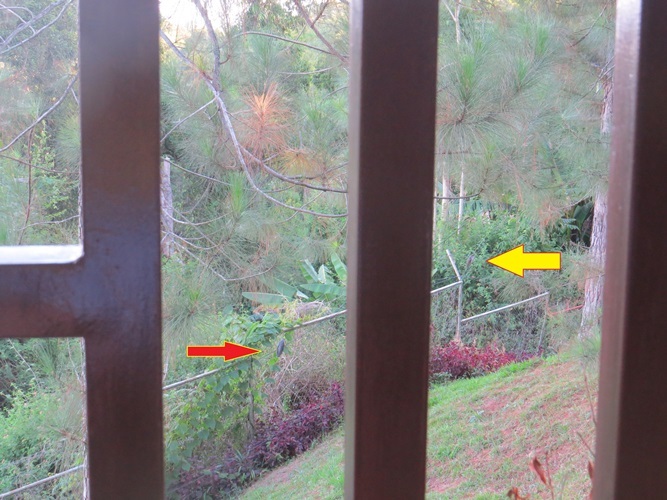 One of the first two would venture in the resort’s property and perch in the fence and pine tree branches around the cottage where the three of us were staying in rooms facing different sides. It looked smaller than the other ones, so we thought it was a juvenile. It was only back in Manila, after I wrote my first version of this contribution and Sylvia Ramos referred me to Christian Perez’s article in e-BON discussing the split of the species (See https://ebonph.wordpress.com/2014/06/04/ask-the-experts-the-oriental-cuckoo-and-other-splits/) that we realized that our friendly bird could be a Himalayan Cuckoo. 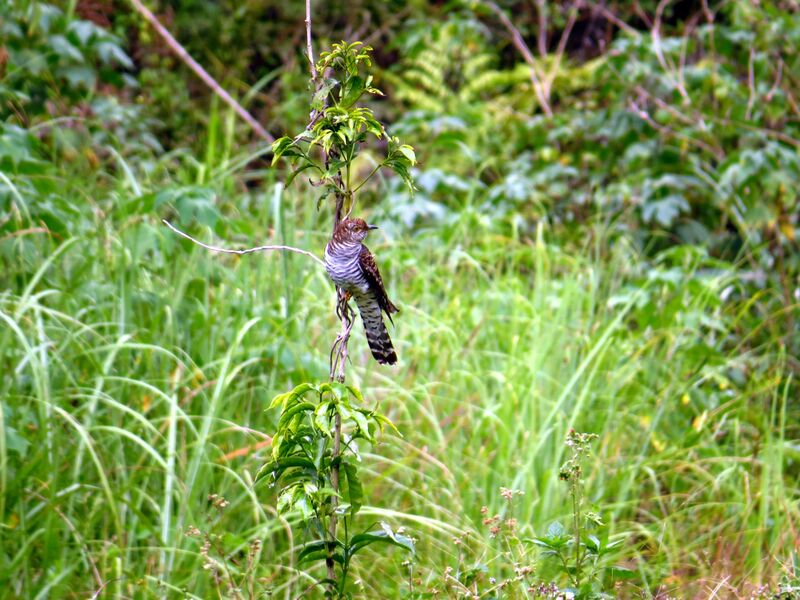 We were fortunate to take a picture where it appears nearby an Oriental Cuckoo, showing its smaller size [From now on, I will assume it is a Himalayan Cuckoo based on the size—and for easier readability of this article—but I leave it to the experts to decide on it at a later time based on the evidence]. 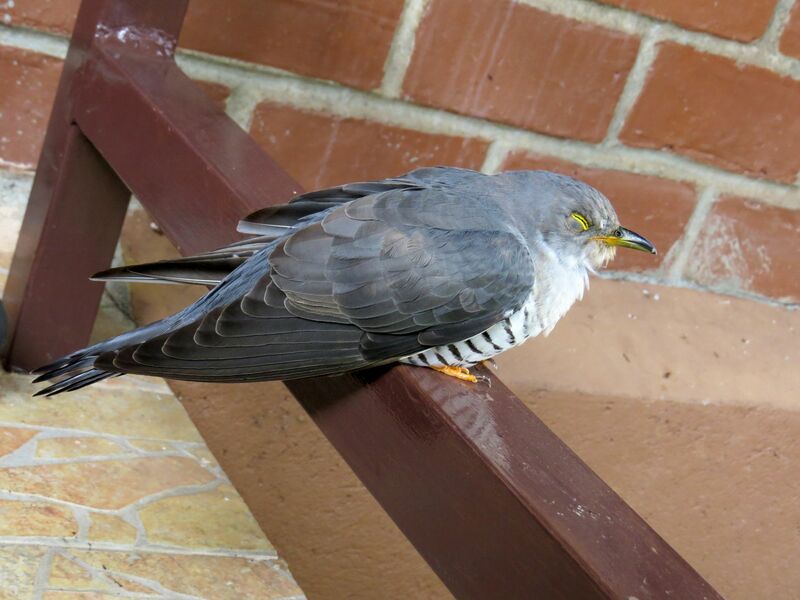 In our second week, the Himalayan Cuckoo, let’s call him HC, began to perch closer and closer to Gino’s balcony. Gino had arranged there a little table and a chair to read and write, while keeping the binoculars and his Canon 50X HS close at hand (The cottage is just in the border of a forested patch). The bird would pose for Gino to take his picture less than 10 meters away, and Gino would show us his amazing close-ups. A few days later, Gino called all excited his neighbors—Rene and I—saying: “the bird is in my room.” When we arrived, HC was in Gino’s balcony under the little table, all curled up and having a hard time keeping his eyes open, as if wanting to sleep. HC seemed unmoved by our presence. Rene, a veterinary doctor by profession, tried to lift it to help it fly, but HC just moved a bit to the lowest bar of the railing, slightly opening the eyes to acknowledge our presence, then closed them again in tiredness (See picture). He pooed a semiliquid white substance and Doc Rene diagnosed: “he is sick.” Gino went inside, got the tabo (Plastic container to pour water from a pail), filled it with water and began to pour little amounts in the beak of HC. The bird would open the beak and let a few drops go down his throat. After a few sips, Gino left the container nearby and we left to join an activity. Is it sick? Photo by Juan Mesquida. When Gino returned, HC was gone. On the next day, we all three happily noticed HC flying around and posing again for pictures at very near distances (See picture taken when he returned). This behavior does not match the “secretive” or “difficult to see” descriptions that we read in the Kennedy. Oriental/Himalayan Cuckoo feeling better! Photo by Juan Mesquida. The Oriental Cuckoo and the Oriental/Himalayan female Hepatic Cuckoo, and even a second Oriental/Himalayan female Hepatic Cuckoo that showed up towards the end of our stay, did not get so close to us but were rather visible in various places in the vicinity of Mountain Pines Place. Oriental or Himalayan female Hepatic Cuckoo. Photo by Juan Mesquida. There is still an end to the story. The afternoon before we finished the seminar, Gino was reading again in his balcony, and HC landed in some plants just by the railing of his veranda, a little more than an arm’s length away, and stayed there for a long while. Did HC know that Gino was leaving or was he the one about to fly to the Himalayas? I cannot really explain HC’s behavior, but it right away came to my mind the famous chapter in Saint Exupery’s book, of which I copy just a few lines: “What must I do, to tame you?” asked the little prince. “You must be very patient,” replied the fox. “First you will sit down at a little distance from me–like that–in the grass. I shall look at you out of the corner of my eye, and you will say nothing. Words are the source of misunderstandings. But you will sit a little closer to me, every day . . .” THE END. Photo of the two cuckoos side by side. Photo by Gino Lacaya.